Sometimes, too much hype can lead to a major letdown. A letdown is what I expected when I finally visited the much lauded Cap Juluca after years of reading glowing reviews and seeing it top award lists the world over. 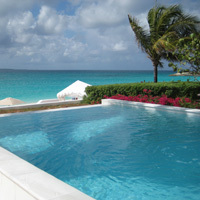 But, while on the boat ride over to Anguilla from St. Maarten (on Cap Juluca’s private speed boat), sipping champagne and chatting with another couple who gushed about their decade-long love affair with the place, I started to get the feeling that my skepticism may be proved wrong – and, wrong I was. The Cap Juluca didn’t disappoint. The 21-year-old resort is currently in the midst of 80-million-dollar renovations which have already transformed the main house and lobby, and, by year’s end, will overhaul all 18 villas (which, currently, aren’t shabby but lack the sophisticated Moroccan elegance seen in the renovated main house). All enhancements, including a new oceanfront infinity pool and spa, will stay true to the timeless architecture – white-washed Moorish domes, turrets, and all – that has made the resort so famous; original architect, Oscar Farmer has even come out of retirement to help with the project. What is so great about this resort, this sense of exclusivity and privacy, remains. Even on a weekend when the resort is fully occupied, like on my past visit, the beach was never busy and the noise level never higher than a hum. We didn’t even see the couple that rode over with us on the boat the entire duration of our stay – it wasn’t until the security line at the airport when we spotted them again! Poised on 179 acres, including a picture-perfect stretch of white-sand beach on Maundays Bay, accommodations in the 18 villas house no more than 6 units each. They range from superior rooms to pool suites (new private pool villa pictured) yet they all feel like your own personal hideaway. Every room even has its own private pathway leading to the beach so you’ll never run into anyone on your way to and from the sand. Post renovations, the bones of the rooms/suites will pretty much stay the same but the new interiors will swap the built-in furniture and neutral color scheme in favor of customized fittings with a Moroccan flair and colorful accents like mosaic tiling in the bathrooms and behind the beds. There’s also something to be said about Cap Juluca’s lengthy celebrity guest list which includes the likes of Brad and Jen (pre-breakup), Jay-Z and Beyonce, Arnold Schwarzenegger, Denzel Washingtion, Eddie Murphy, Caroline Kennedy, and most recently, Sir Paul McCartney. Their taste is expensive (rooms will currently run you about $595 to $1595 per night) but I mean, c'mon, stay here and you're running in the same travel circle as a Beatle.